Candidates after submit their form for the RPF Constable Recruitment 2018-19, Search for Railway Constable Admit Card 2019 Physical Test download link. If you are finding your RPF Constable PET Admit Card 2019 link, then you are on the right page to download the RPF 2019 Constable PET Call Letter. The Board may activate the RPF Constable Call Letter 2019 in the same month. This year officially the RRB going to recruit 9739 vacancies for Constable & SI Posts. There is official info about RPF Constable 2019 PET Date. 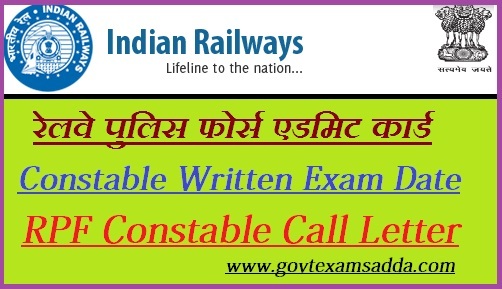 The Board releases the Railway Constable Exam Date, We have update it on our page. So you can check it here below para. The RPF starts to release the Railway Constable Call Letter 2019 in April. Aspirants those have qualified the Constable Written Exam can access the RPF Constable PET Admit Card 2019. The RPF Constable Physical Exam starts from April. We have advice that they start their exam preparation according the RPF Constable Syllabus 2019 PDF. Aspirants need to be ready with login ID and Password to download Constable Call Letter 2018. In the Physical Efficiency Test (PET), Aspirants have to perform certain tasks in a stipulated time. This round is qualifying in nature and no marks will be awarded to the candidates. Aspirants can check the tests given in the table below. In Physical Measurement Test (PMT), Qualified aspirants have to fulfill the physical standards. Male candidates have to meet the minimum standard for height, chest size in order to clear this round. Female candidates for this test should have the prescribed height. To know the eligibility conditions, check the table given below. The written test will be multiple choice objective type (MCQ). There will be 120 Questions/ Marks. The time duration will be 01:30 hours (90 minutes). There will also be a negative marking. 1 mark will be deducted for each incorrect answer. Firstly, open Railway Recruitment Board (RPF) official site. Check for RPF 2019 Physical Admit Card Notification. Click on the notification and read given instructions. RPF Constable 2019 Call Letter will be shown on the home screen. Save/ Print the Railway Protection Force Call Letter. Aspirants who are searching for RPF Region Wise PET Admit Card 2019, They must get their Railway Constable Admit Card by using above given process. If anyone face doubt regarding RPF Constable PET Admit Card 2019 then they may visit on our page or stay tuned with us.